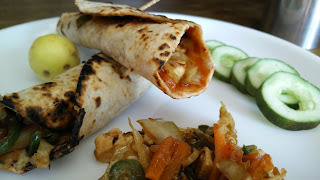 Kathi roll is very common and quick recipe which you can be prepared with any stuffing but we made it healthy by using wheat flour roti and not refined flour roti. 1. In a Kadai/ pan, heat oil and sauté all vegetables, spices, paneer pcs. Add soya sauce. And cook for just 5 min. 2. On the surface of roti, spread a layer of tomato ketchup. Place the stuffing in the centre and roll the roti to make cylindrical roll and seal with help of tooth prick. Serve with cucumber slices.